Sue: …when the baby died it was absolutely devastating to us because not only did we lose this child and all of our dreams, we also lost our belief system. It was the first time we truly experienced grief …. we decided to take a long car trip out west to recuperate, and re-evaluate our lives, and our first stop was in Dayton to visit our psychic, Amal. Ray: It makes perfect sense that people who run a cartoon newspaper have their own psychic, doesn’t it? Where else would something like this come from? Sue: One of the things Amal discussed then was the business we’d be starting in the fall – this was in April – and Ray said, “Do you mean the fall of our lives?” because we had no business idea or plan. Amal said, “No, spring, summer, fall!” Then we headed across country and camped every night and worked our grief out. …. [The couple came upon a cartoon newspaper in Santa Cruz, CA, and decided to publish one themselves back home.] We went out west aimless: now we had a name for this thing and all the way back to Ohio we were daydreaming and imagining this newspaper, and what it would be. At some point, we decided we would leave Athens and do this in Cleveland, because that would be a much bigger market. The latter sentence is very funny, as is a section of their website called Love & Hate Mail (see image below for an example)–a brave idea for an About Us page. 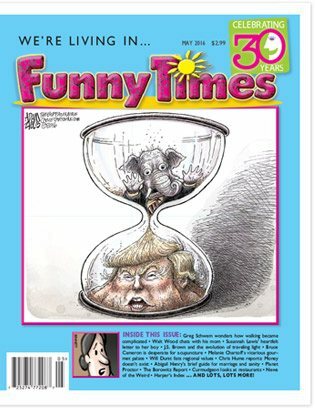 Thirty years later, the Funny Times market extends across the US and maybe the world. 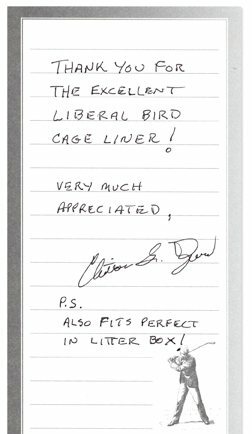 Thanks to Susan, Ray, and the staff for making the world a little funnier each month.